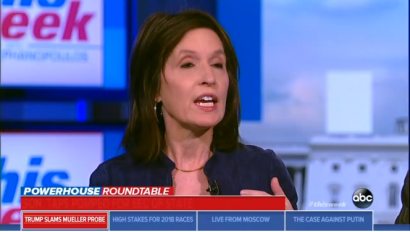 In what really could only be described as a completely bonkers conspiracy theory, The Nation magazine editor Katrina vanden Heuvel suggested Sunday that Rex Tillerson was fired from the secretary of state position because his replacement was funded by the Koch brothers and because the administration wanted a war with Iran. If you’re confused, don’t worry, the rest of the liberal panel on ABC’s This Week didn’t seem to be able to follow her convoluted mess either. George, the Mueller investigation should continue. Must continue. But there was something else that happened this past week that should happen. Gina Haspel, a practitioner and advocate of torture was nominated to be head of the CIA. And the Senate Intelligence Committee, you had Senator Lankford on of the committee, has been sitting on a 6700-page report that must be declassified. It was commissioned by the committee. “But the declassification of such information is vital in the public interest especially as we sit here on the 15th anniversary this month of a war we were taken into by lies, by deceit, and the destabilization of the Middle East and our country,” vanden Heuvel continued to ramble before liberal Roland Martin brought it back to McCabe. After allowing the panel to discuss the topic of the show for a little longer, vanden Heuvel interjected yet again with her conspiracy. “But again, I come back, George. There was more news this past week. A lot of ink and talk spilled about McCabe and Mueller. What about the new secretary of state,” she asked. “He gets more funds from the Koch industry brothers and he wants to go to war with Iran,” Vanden Heuvel decried as American Conservative Union head Matt Schlapp explained that, as a congressman, Mike Pompeo represented their hometown. The rest of the panel began to talk over her seemingly to drown out her nonsense. But Vanden Heuvel continued despite the ruckus: “No tears shed for Rex Tillerson. There are tears shed for a hawk and it now seems—If I just could, the constant in this administration seems to be a desire to take this country to war– to conflict with Iran–” But she was eventually cut off. Host George Stephanopoulos appeared to appease vanden Heuvel by acknowledging that her point was important, but argued the media struggled to keep up with all the important news flooding out of the administration. “I know, I’m not making your life easy. I’m sorry,” she apologized. Trying to follow vanden Heuvel’s logic is quite difficult. It might be safe to assume it requires a corkboard, a lot of pictures on it, and some red string connecting everything like a web.